Taoiseach Enda Kenny created a political timebomb for his successor by inviting US President Donald Trump to visit Ireland. Mr Trump confirmed that he intends to visit during the course of his presidency, saying: "I love Ireland. I really love Ireland. I'll be back". He described Mr Kenny as his "new friend" and a "great guy" as the two attended the annual Speaker's Lunch in Washington to mark St Patrick's Day. But the Taoiseach was immediately criticised for inviting the controversial president here. Mr Kenny is unlikely to be in office when that visit happens, as he is under pressure to outline an exit strategy to Fine Gael colleagues following his return from the US. But the future taoiseach who does welcome Mr Trump will face huge political pressure as well as protests, opposition parties warned. 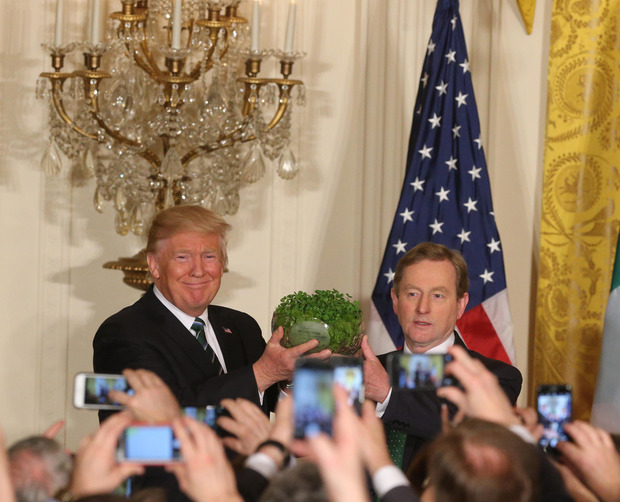 Mr Trump appeared to strike up a friendship with Mr Kenny during their White House meeting before he was presented with the traditional bowl of shamrock. He praised Mr Kenny as "a great guy", saying "the people of Ireland and the people of the United States have stuck together, through good times and bad times". He even ended the day by tweeting a photo-montage of his day spent with Mr Kenny and the Irish delegation. At no point during their meeting was the Taoiseach's previous comment about Mr Trump's "racist and dangerous" language raised. And while Mr Trump gave no firm commitment on removing the threat of deportation hanging over 50,000 undocumented Irish, he did acknowledge that Irish emigrants in the US "have had tremendous success". On a day when Mr Trump cleared his entire diary to welcome the Irish delegation, the Taoiseach's standout moment was an address on Capitol Hill. At a lunch attended by Mr Trump and some of America's most senior politicians, Mr Kenny went off-script to urge swift immigration reform. "We would like this to be sorted. It would remove a burden on so many people that they come out into the light and say 'now I am free to contribute to America as I know I can'," he said to rapturous applause. 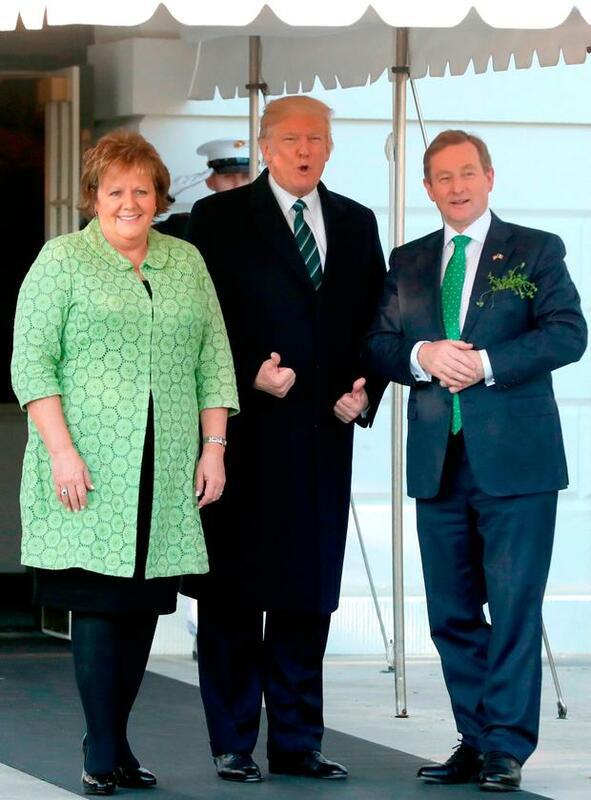 Mr Trump smiled as the Taoiseach talked about how the American national anthem describes the country as "the land of the free and the home of the brave". He said that Irish emigrants had "fought every war for America and died for America, and will continue to do so". "All they want is the opportunity to be free. This administration, working with Democrats and Republicans, I hope can sort this out for once and for all." Addressing Mr Trump directly, he said: "For future years, you can determine what it is you want to do. As George Mitchell said, you can't return to open immigration, but for the people who are here, who should be here, I hope that's something your administration will reflect on. "We in Ireland will give you every assistance. There are millions out there who want to play their part for America and want to make America great." Sources said that during the leaders' private meeting Mr Trump gave "positive vibes" in relation to the issue without making any promises. Mr Kenny is only the second EU leader to meet face to face with Mr Trump and spent a significant portion of the meeting trying to convince the Eurosceptic of the value of the union. "Membership of the European Union has been transformative for Ireland's economy and society. Ireland has always been a fully participating member. That will not change," he said. "I firmly believe that the EU can and will continue to be a force for good on the global stage. Ireland and Europe will never be the enemy of the US". Meanwhile, Mr Trump said he had opened up the doors of the White House "to celebrate America's commitment to Ireland". "They have tremendous success all over the world, but in this country they have had tremendous success," he said. He added: "We're going to have a very good long-term relationship with Ireland." Mr Kenny confirmed afterwards that he asked Mr Trump, who owns a golf course and hotel in Doonbeg, Co Clare, to visit. He said he had been welcomed to the White House and "in Ireland invitations are always returned". The Taoiseach declined to answer questions about whether he apologised to Mr Trump for describing comments he made last year as "racist and dangerous". However, sources confirmed to the Irish Independent that the issue didn't arise during the meeting. Labour leader Brendan Howlin criticised the Taoiseach for failing to challenge Mr Trump's travel ban, or on LGBT issues. The Green Party said any visit by Donald Trump would be strongly protested, and that Ireland should not condone his actions by inviting him. People Before Profit TD Richard Boyd Barrett said that the Taoiseach was "grovelling before Trump with bowl of shamrock - a shameful abdication of responsibility to challenge the frightening rise of far-right movements across the world".